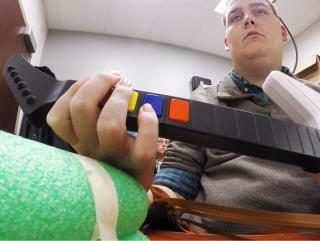 (Newser) – A paralyzed 24-year-old man has regained some use of his right hand, controlling it with signals relayed from electronic sensors in his brain, the AP reports. Ian Burkhart of Dublin, Ohio, can grasp a bottle, pour its contents into a jar, pick up a stick and stir the liquid. He can grab a credit card and swipe it through a reader. He can move individual fingers and hold a toothbrush. But he can do these things only for a few hours a week, in a laboratory where he is hooked up to an experimental device that interprets his brain signals and stimulates his muscles with electrodes on his forearm. With improvements, researchers hope the system will eventually aid the everyday lives of people like Burkhart with spinal cord injuries, and perhaps others with stroke or traumatic brain injury. Make sure he can hold a gun and die "for his country" on some dune.